The next scheduled event is the Cork Rodeo on Saturday the 18th of April. More information is available on the event page: Cork Rodeo 2015. Registration is open at: Cork Rodeo Registration. Huge thanks goes to Micheal Coughlan for organising! The 2015 National Team Trials were held on Curragower wave in Limerick on the 21st and 22nd of March. This was a great event, the weather and water levels played ball and competition for a place at the World Championships in Canada this summer was fierce. Results have been posted here: 2015 Team Trials Results. Congrats to everyone who made the team! Check out Colm Healy’s report on Galwayfest HERE! A great weekend was had by all, fair play to the Galway crew for putting it together! Freestyle is a sport that is constantly evolving, with new moves being invented every year. The general format for freestyle competition involves each competitor getting a timed run, in which they have to perform as many moves as possible. Scores are awarded for their technical difficulty and the variety of moves the competitor completes. Many of the freestyle moves can be attempted on flat water, and this is how many people first get into the sport. 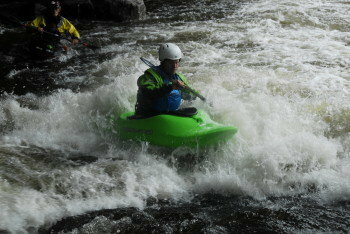 Most rivers contain waves and holes that can be used for training purposes. However, advanced events require powerful features such as Sluice weir in Dublin, Curragower in Limerick and Cliften in Galway. Most of Ireland’s top competitors spend time abroad, training on world class rivers such as the Ottawa in Canada and the White Nile in Uganda. As the sport evolves, so does boat design. Most manufacturers release a new design each season. 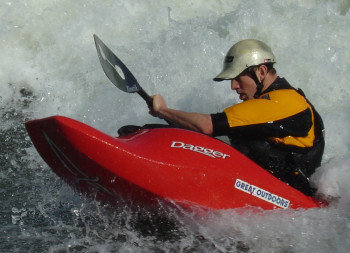 In general, a freestyle kayak is very short (often under 2m) and made of plastic.